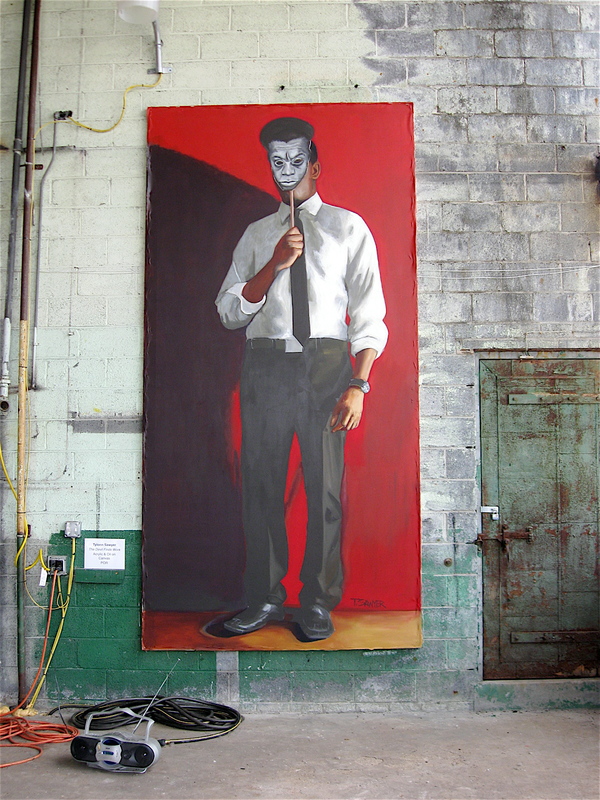 There is an 18,000 square foot building in Highland Park that’s full of art. 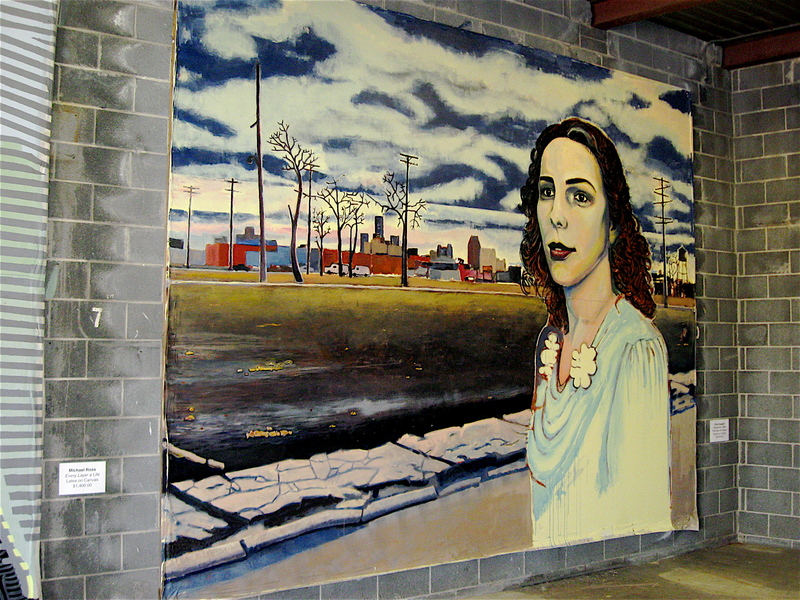 The building is located in a small industrial section of Highland Park, just off Hamilton Avenue north of Oakman Boulevard. 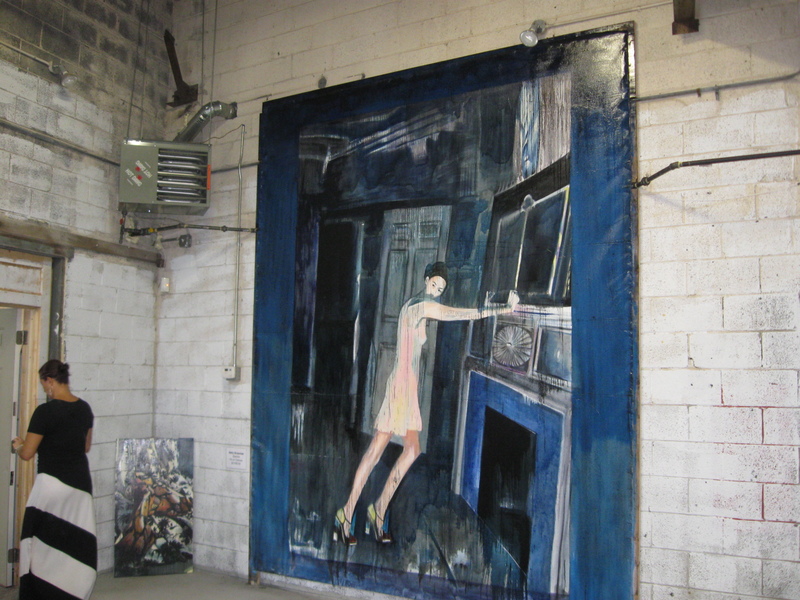 It’s a vintage 1920’s building, constructed in the Art Deco style. The old place has walls of windows with hundreds of panes that extend from about 5’ above the floor to the 30’ ceilings. 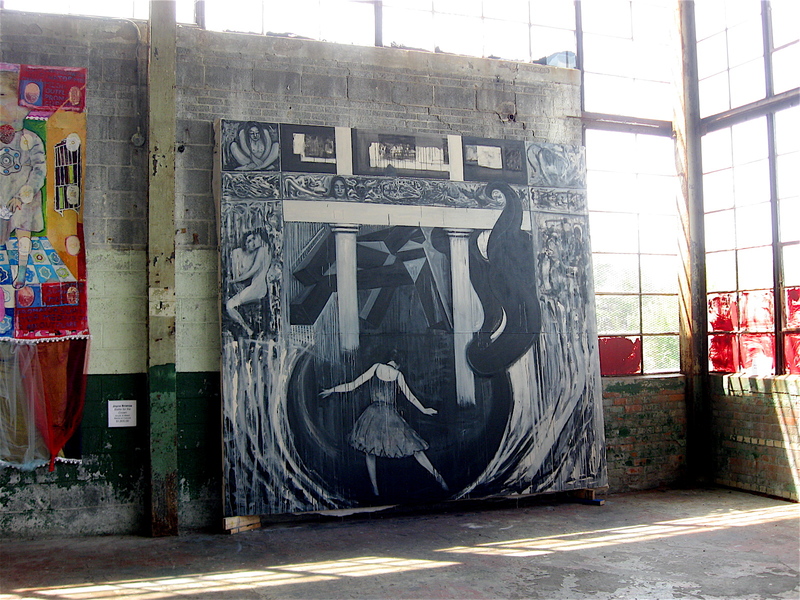 The windows allow sunlight to flood the interior space creating ideal lighting for artists. 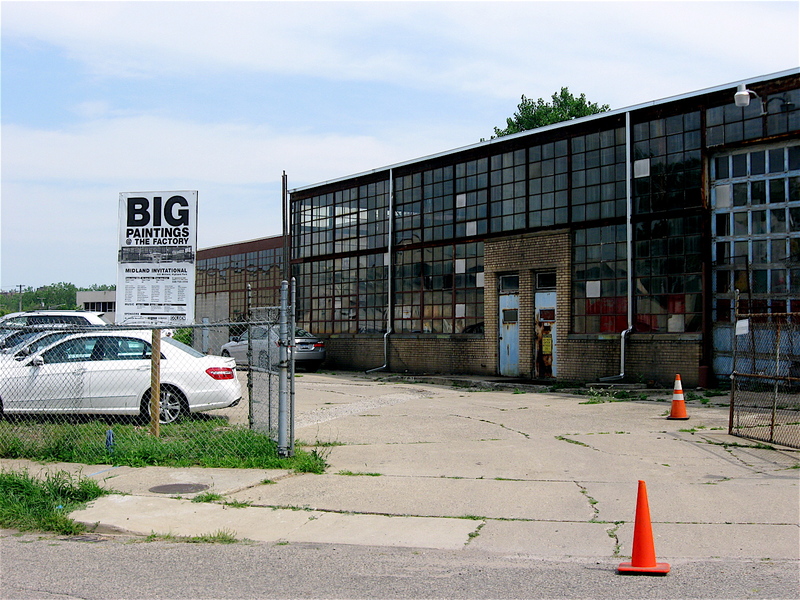 The well-built, industrial place is the former home of Lewis Metal Stamping, an early supplier to the once booming auto industry in both Highland Park and Detroit. 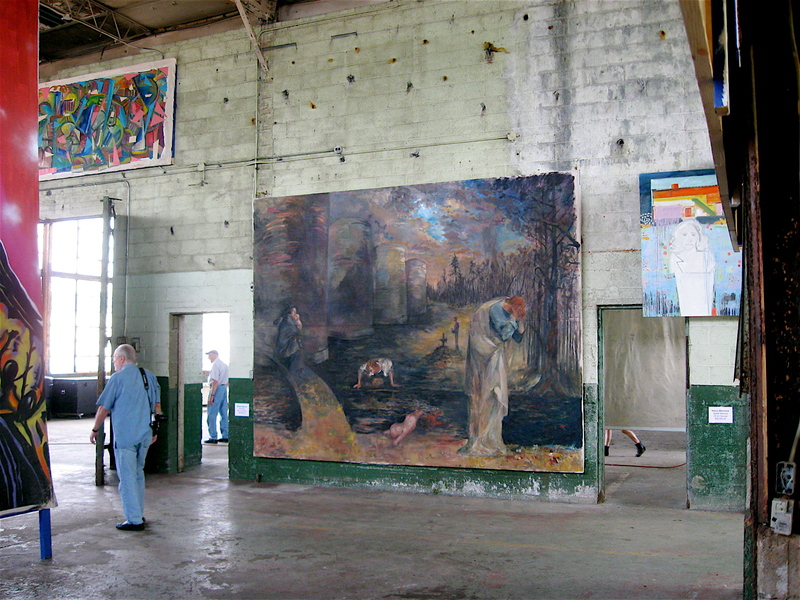 Some of the windows look out to green, lush fields where other factories once stood but have been torn down over the years. In some ways, it’s almost like being in the country. 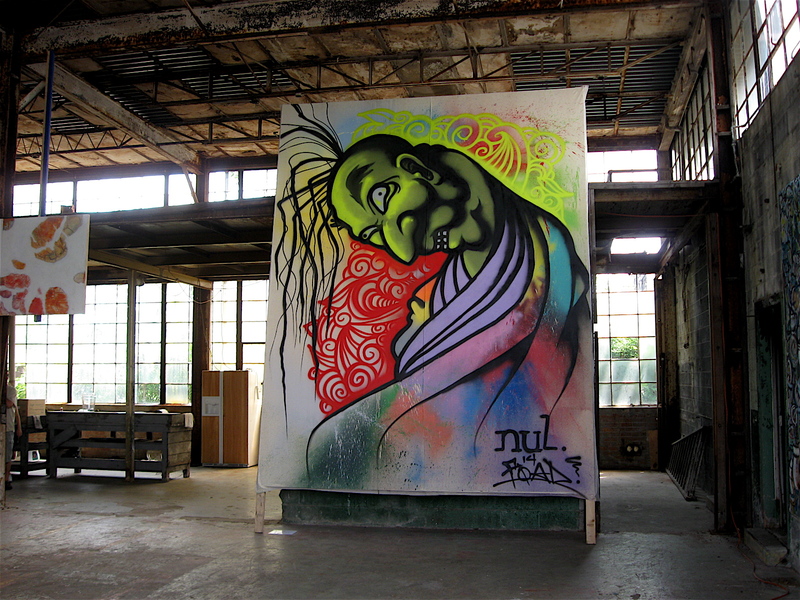 Today the building is used as art studio space where large-scale paintings, (some 20’ tall, others at least 30’ wide or more) fill the vast industrial space. 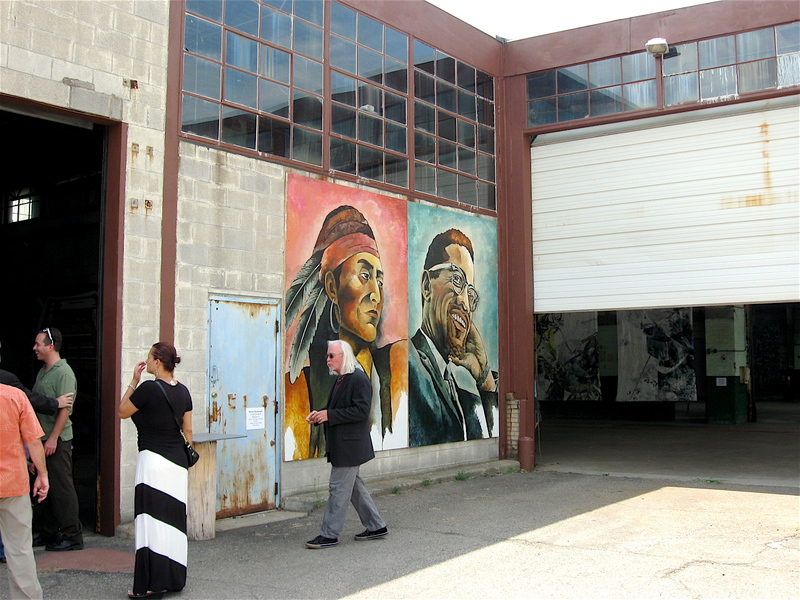 I had the opportunity to tour the studio this past weekend to view the enormous art pieces created by 47 local artists. They were amazing! 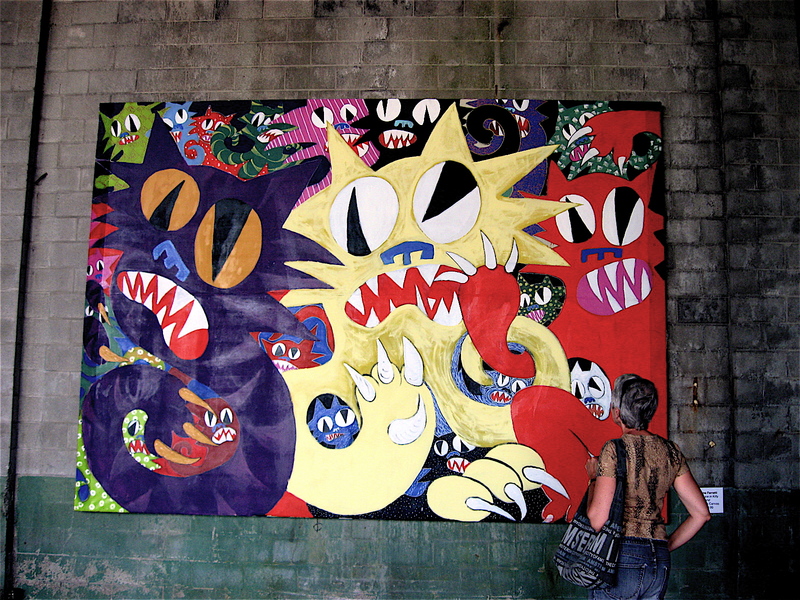 The huge pieces were painted in a variety of colorful styles that include portraits, abstracts, line drawings, and modern interpretation of religious renaissance paintings. 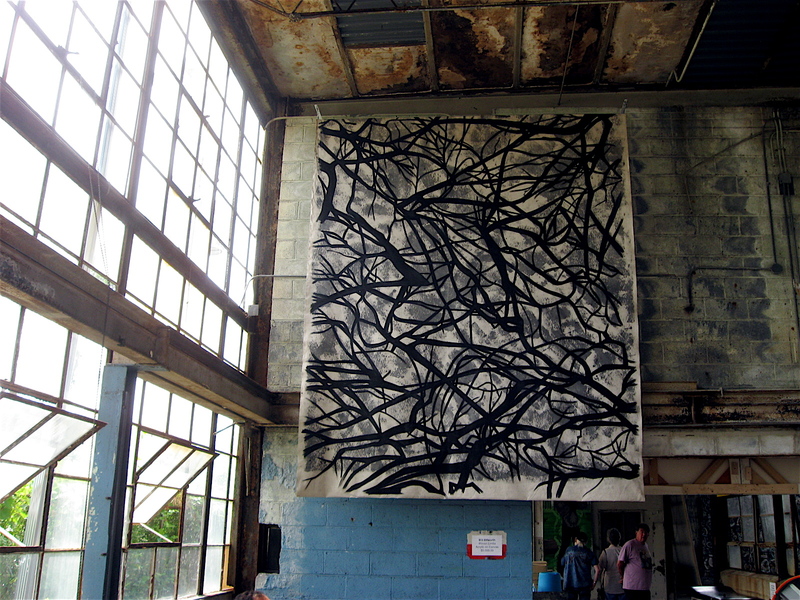 The art is all part of a show called “Big Paintings @ The Factory” that had its public opening a few weeks ago. 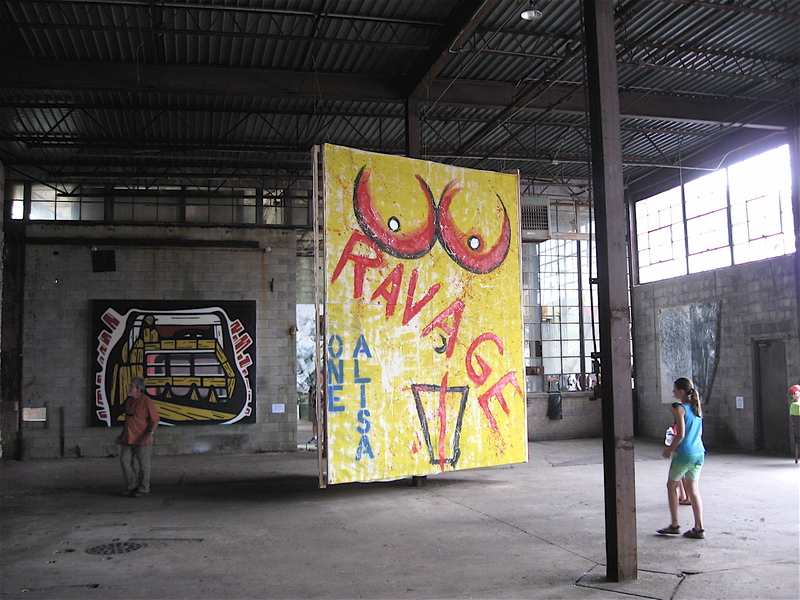 Currently, reservations must be made to view the art. 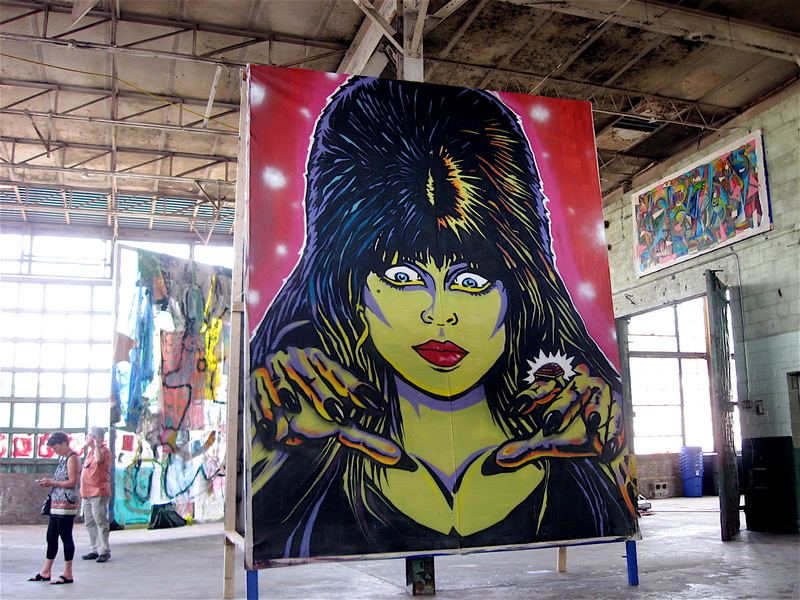 I was fortunate to be invited to a private tour of the factory. A big thank you goes out to Bruce Giffin for organizing the tour and extending the invite to me. I appreciate it! Here is a little more of what I saw. 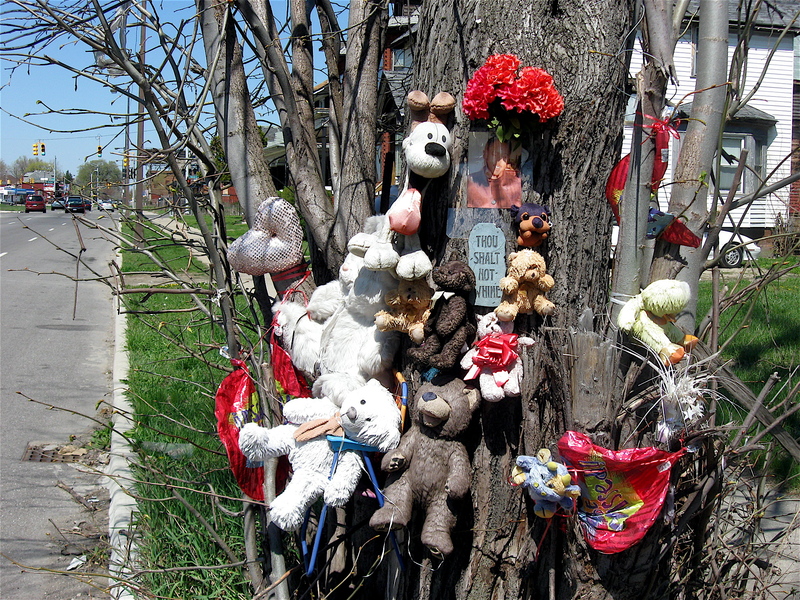 While riding my bicycle in Detroit, it isn’t uncommon to see utility poles with makeshift memorials or shrines made of stuffed animals for someone who died. They can have up to 15 to 20 of the colorful animals nailed to the pole, along with a photo or two of a dead child or teen. Sometimes they have the birth and day of death written on the photo. Some of the little shrines have religious candles or mementos of the deceased surrounding the base of the pole. There was one memorial I recently spotted in a field, close to a sidewalk on an unassuming street void of most homes. The little shrine to the dead was a bit different from the other memorials of this type I’ve seen. It wasn’t momentos nailed to a pole, and it didn’t feature the stuffed animals that are normally found on memorials of this type. 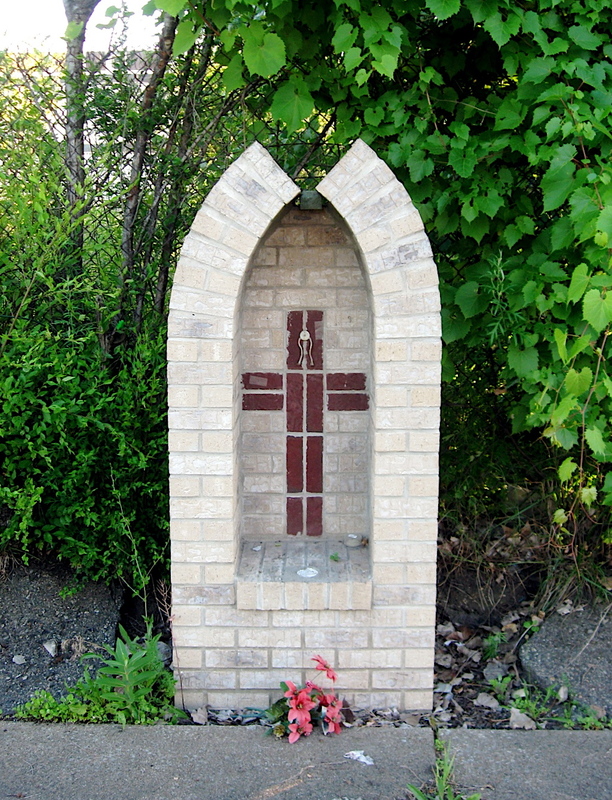 It was made of bricks, a small religious statue, and a homemade wooden cross. There are two elements to the little shrine. One part is constructed of white bricks in a religious arch pattern, and the center is recessed as if it was built to hold a religious statue. In the center of the white brick monument are a few red bricks incorporated into the back, forming a cross. It looks like something that would be found in a church or cemetery. 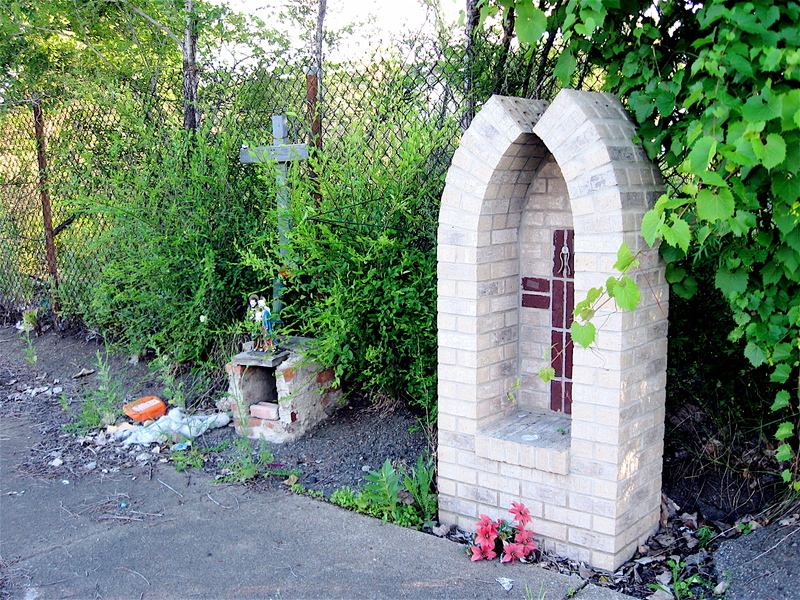 Next to this four-foot tall shrine of sorts is much smaller, cement covered brick structure that reminds me of a section from a chimney. That part of the shrine is not as refined and has a wooded top. On that top is a small statue of Joseph and Mary holding the baby Jesus. 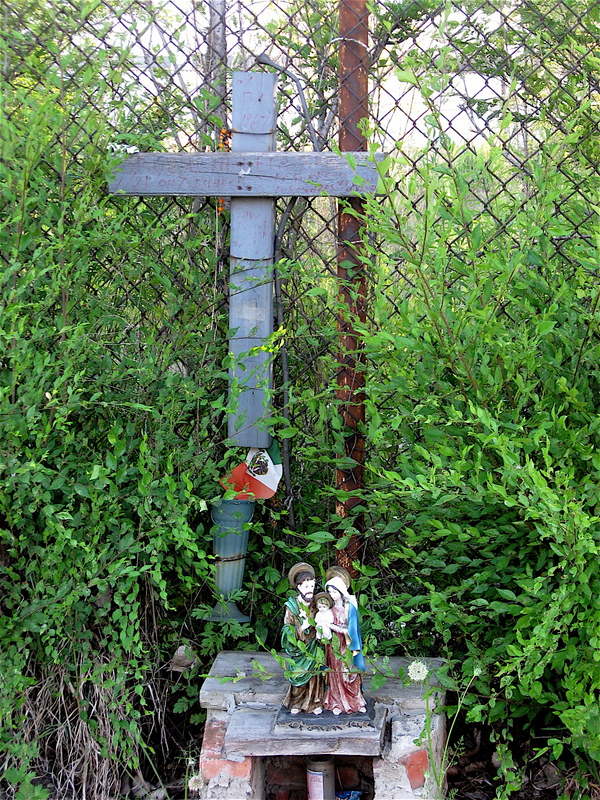 Right above this small memorial is a wooden, handmade cross wired to a chain linked fence. Just below the cross is a vessel also mounted to the fence, and in that is a small flag of Mexico. The whole scene reminded me of something that would be found at hundreds of gravesites in any cemetery. There was nothing there referring to someone’s death like many utility pole memorials I see. 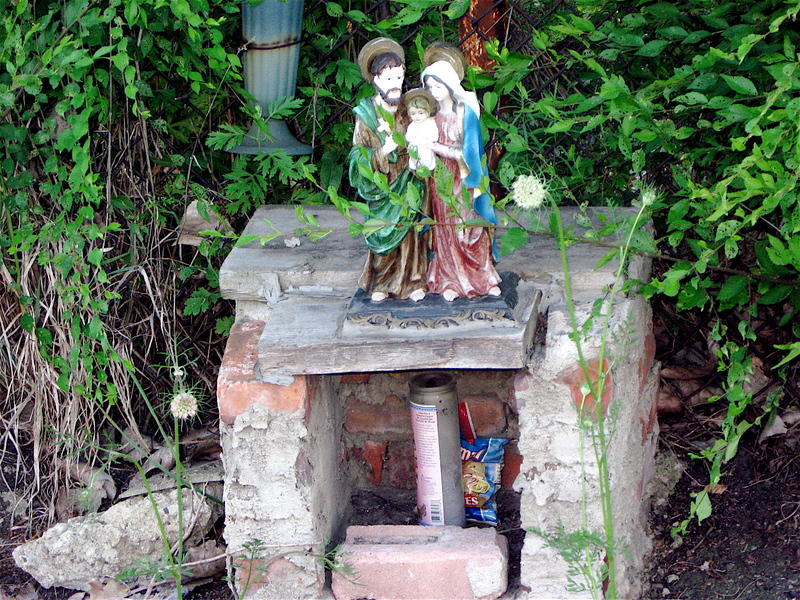 Because of that, it makes me wonder who constructed this little shrine on a desolate street on the southwest side of Detroit. It also makes me wonder why it’s there, and if it is ever visited. 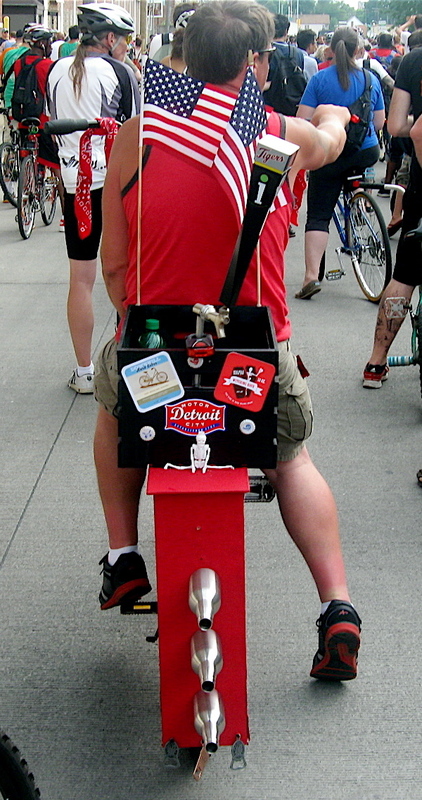 Slow Roll Mondays is a weekly bicycling event held in Detroit. The rides leave every Monday night from various Downtown or Mid-town clubs or restaurants at 7:00 p.m. 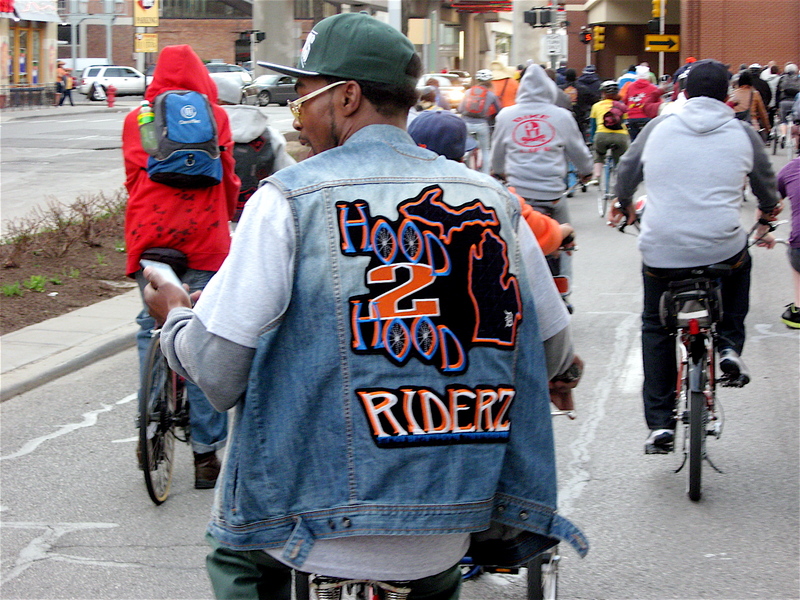 Depending on the time of year and weather, there can be 2,000 or more riders. 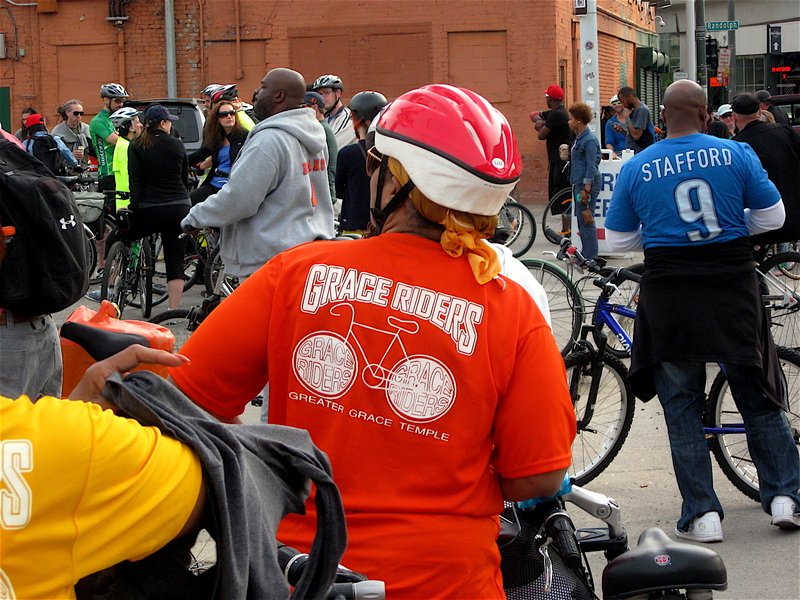 The weekly rides wind their way through various neighborhoods and outlying sections of the city. 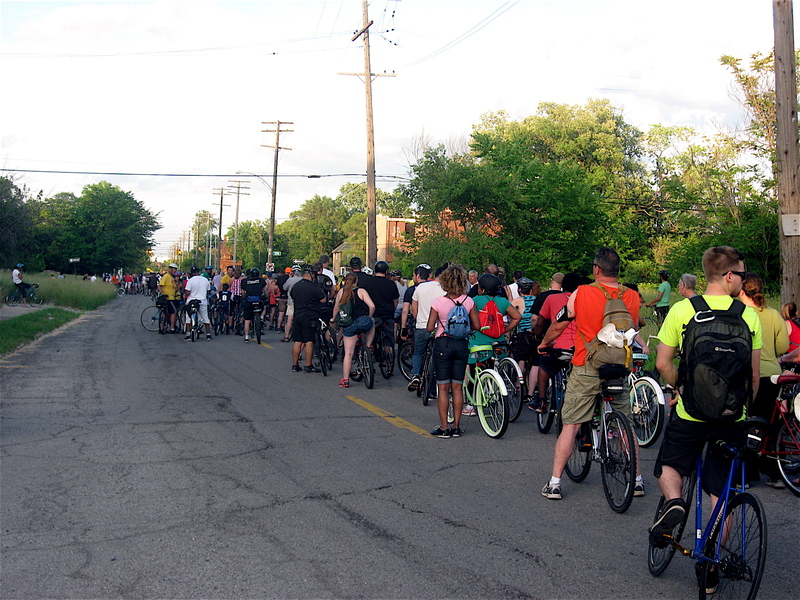 It’s a well-organized ride, and the crew of Slow Roll volunteers does a great job of keeping the riders together; out of the oncoming traffic lanes and to the right of the street so cars can get where they need to go. That’s a huge undertaking, considering the sheer amount of bicyclists that attend the weekly event. With that many bikes, you will always end up behind someone, no matter how good or fast a rider you are. And what do you see from behind? Backs of other riders, and plenty of them. 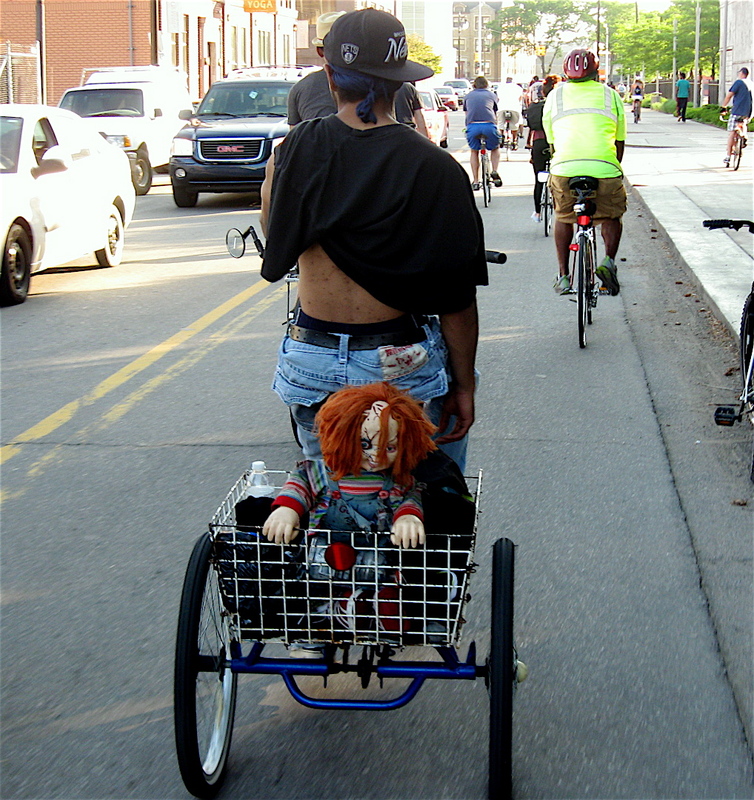 Generally, there is nothing remarkable about backs of other riders. They are mostly covered in plain tee shirts, small backpacks, tank tops and other nondescript clothing or cycling accessories. But, there is more if you look closely at the riders ahead of you. 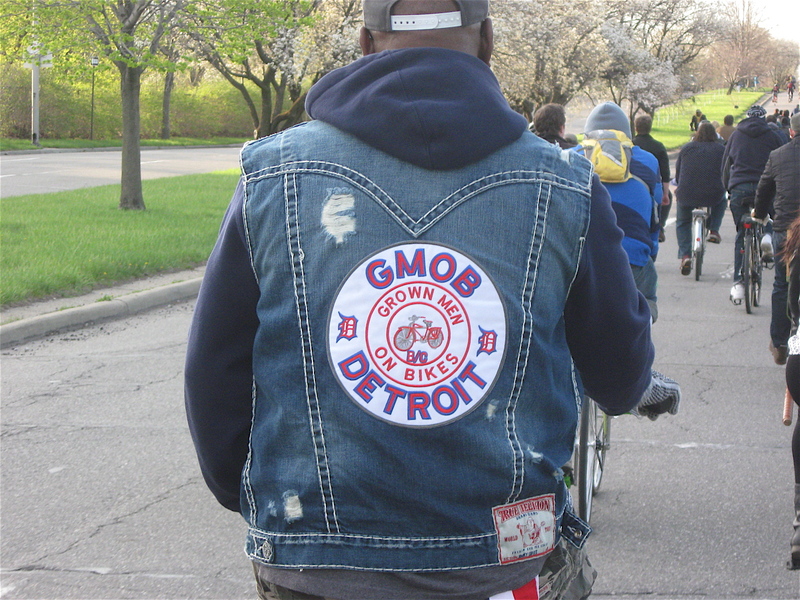 So what else is on the backs on bike riders? Well, plenty. 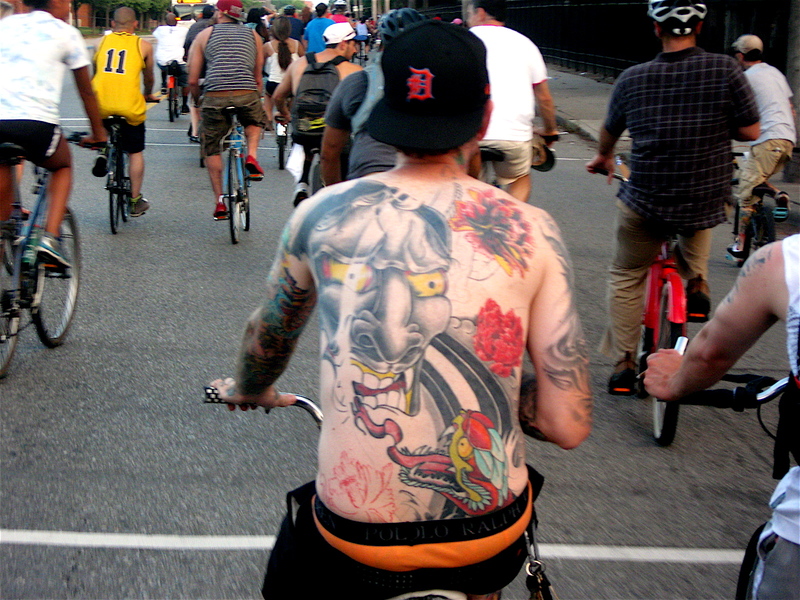 I’ve seen logos for various cycling clubs and fully tattooed backs, arms and necks. I’ve spotted many tee shirts with various brands or logos. 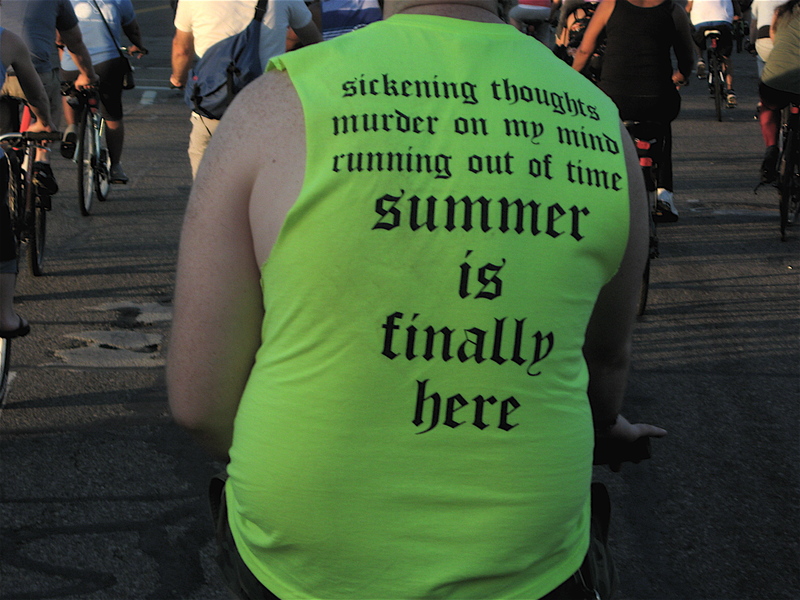 I’ve also come across tee shirts with specific political or other types of messages, not to mention some pretty interesting graphics. 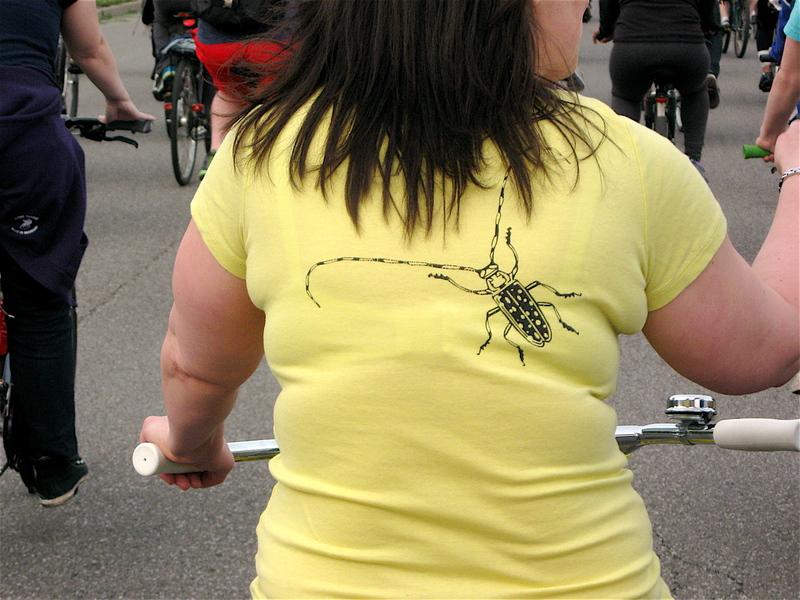 If you ever do the Slow Roll rides (or others), check out what’s on the backs of those just ahead. There is some pretty cool stuff! M-90 in Michigan’s thumb area starts near the shores of Lake Huron to the east and stretches west about 40 miles. 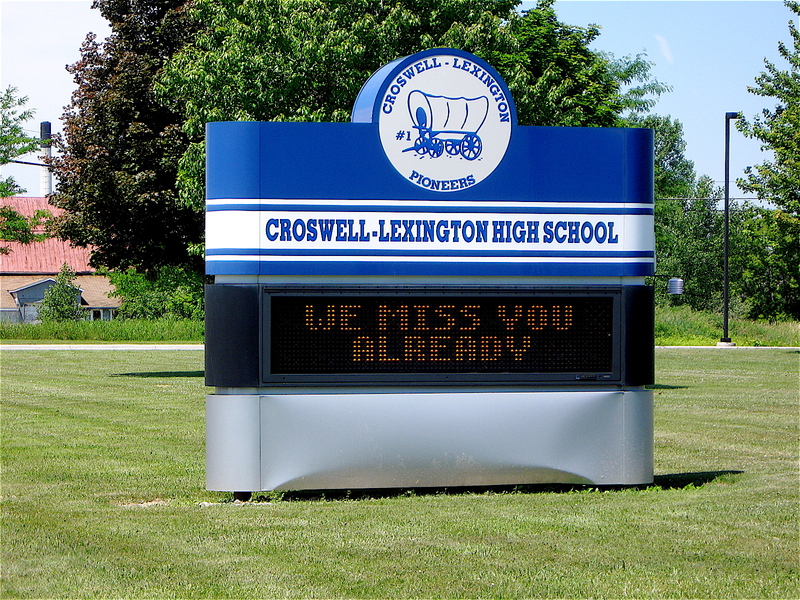 There is a 5-mile section of the road that connects the villages of Lexington and Croswell, two small communities that seem like they’re worlds apart. 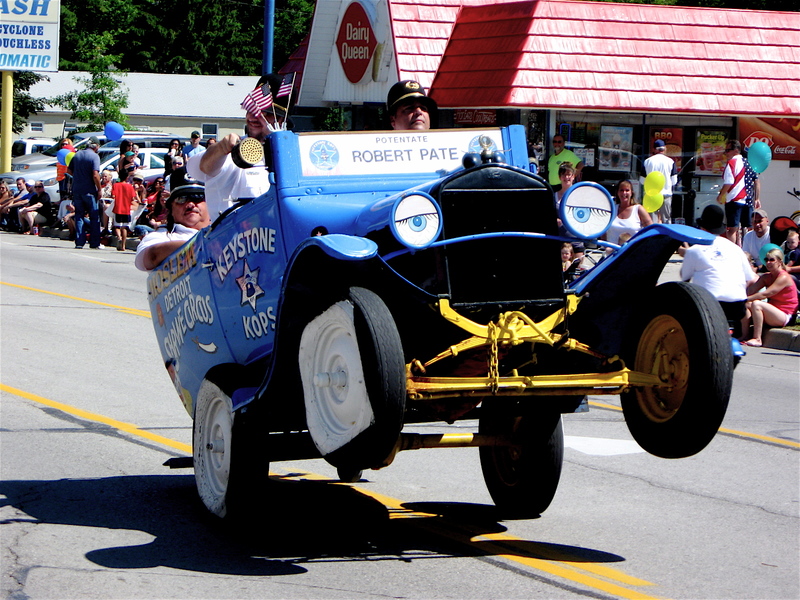 Lexington is on the shores of Lake Huron and is a tourist mecca in the warm summer months. It attracts people with its sandy public beach, modern boat harbor, tourist shops, and small town parades, such as the annual 4th of July Parade. 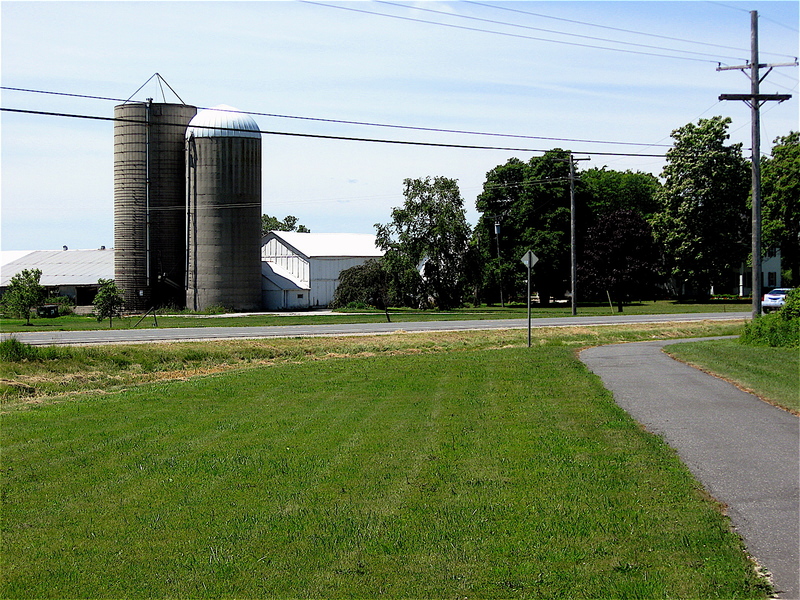 Croswell to the west is a small farming community of about 2,500 hundred people. It caters to the surrounding farms that raise corn, wheat, oats, soy beans, sugar beets, and other crops. The town has many small mom and pop stores offering a variety of goods and services. In addition to those independent stores, there is an old-fashioned, squeaky floored Ben Franklin. That store started years ago as a five and dime retail franchise and Ben Franklins can be found in many small towns across the country. 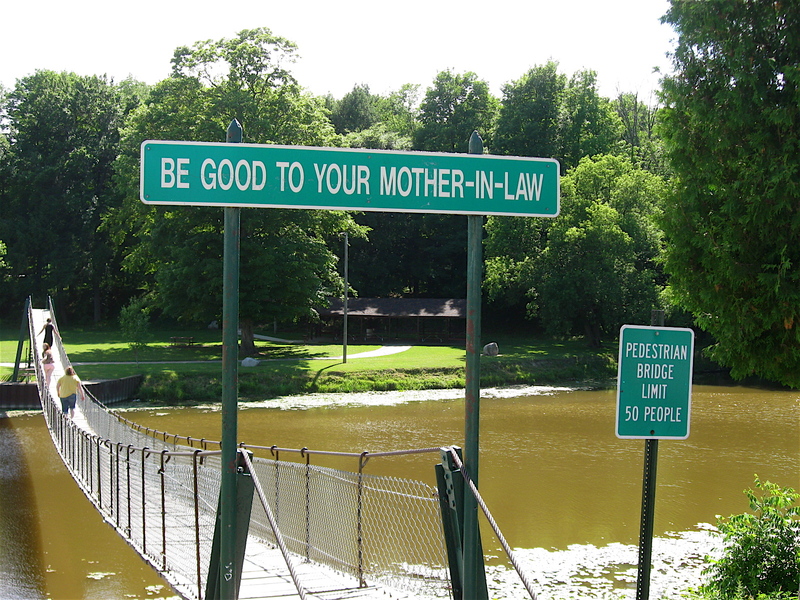 Croswell is also home of the state’s only pedestrian suspension bridge that spans 139 feet across the Black River that runs through the town. I was recently up there and took a leisurely bike ride between the towns along a paved bike path that runs parallel to M-90. Most of the path is about 6 feet wide and set back from the highway at least 15 feet or more. Some sections do run close to the road, but are well marked with tall posts creating a strong sense of safety for both bike riders and walkers. Unlike the city riding I do, I didn’t have to keep looking over my left shoulder watching for cars and city buses that tend to hug the curbs. Nor did I have to dodge broken glass and other city road hazards like geese on Belle Isle. About a mile and a half west of Lexington, the pathway slopes noticeably downward toward Lake Huron to the east. The slope makes for a rather deceiving, strenuous climb while bicycling west. Along the way the paved path passes old fruit orchards and a 36-hole golf course that overlooks Lake Huron to the east. 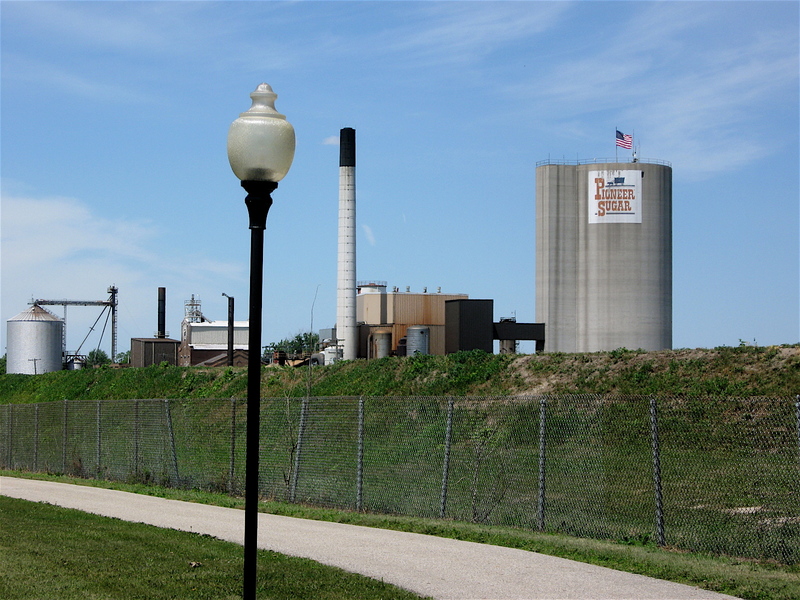 The path also cuts through acres of farmland, past the local high school, and past Pioneer Sugar, one of the area’s largest employers. 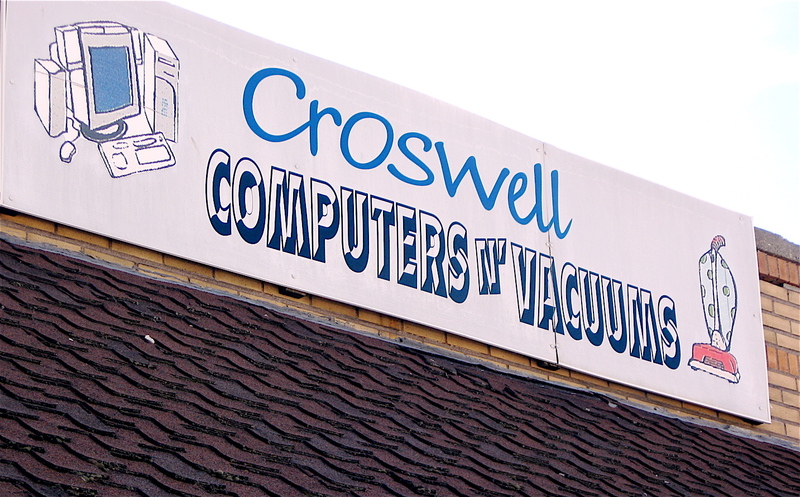 Finally, it ends in Croswell. 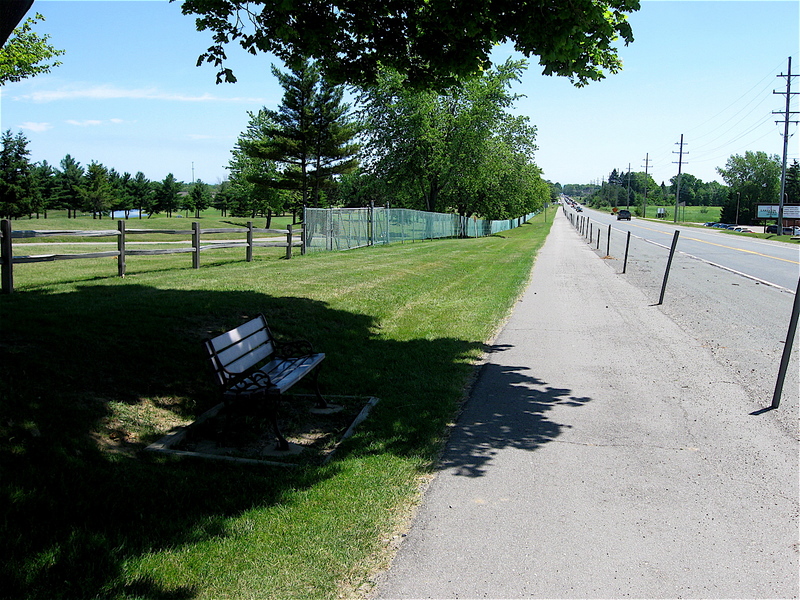 Dedicated bicycle pathways do make sense, especially along two-lane roads that handle quite a bit of traffic such as M-90. There should be more of them. 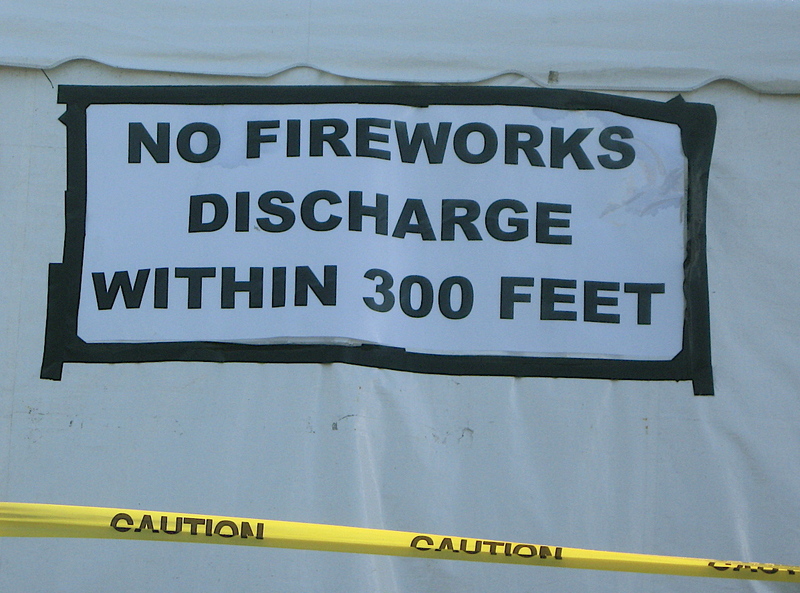 Get ready for a noisy few days!